The world’s love affair with Italian food doesn’t seem to be waning. But what is “Italian food” and why is it so popular? There’s little doubt the world is in love with Italian food. Many of its icons like pasta, pizza and gelato have crossed borders and now belong to the world. Italian products such as balsamic vinegar, extra virgin olive oil, ricotta, buffalo mozzarella, parmesan, pasta, passata and many others line both supermarket and specialist food store shelves.Italian cuisine, the great traveller, has made new homes around the globe and in doing so, its dishes have developed and changed, often to the point where they’re unrecognisable to those from its origins. Inventions such as spaghetti bolognaise, chicken Alfredo, and ham and pineapple pizza don’t exist in Italy but are interpretations of Italian dishes.In Japan, where Italian cuisine is very popular, they have their own adaptations like wafu pasta with yuzukosho sauce. “Wafu” meaning Japanese-style and the yuzukosho is a fermented paste made from yuzu peel, chilli and salt. Eco is right. Even though the differences are enormous from region to region and town to town, his comment also suggests a deep unifying connection that Italians have with what they eat. It’s what drove my mother to buy olive oil from the chemist once we arrived in Australia in 1961. After all, that’s the only place it was available and she needed it to prepare our meals. Central to this connection is the almost obsessive need to either grow or make something yourself or to have intimate knowledge of its provenance. Add the social aspects and seasonality of their food rituals and it’s clear why so many Italians tend home gardens and make salumi, pickles, passata, wine and so on, even once they’ve emigrated. Italian food represents an ideal way to eat. An ideal that is part of the wider “Mediterranean diet” often touted as having the right balance of a little meat, good fat in extra virgin olive oil and a lot of seafood, vegetables, grains and pulses, all washed down with wine. As our societies become more industrialised and food is more packaged and processed in an increasingly globalised economy, the integrity that is inherent in Italian food values is becoming more and more important in a world of fast-food chains, eating on the run and the breakdown of meal -ime rituals. Even Italian restaurant food remains close to its roots in regional home cooking. In 1999, Edward Behr, in his quarterly Art of Eating, observed: “The Italian phrase alta cucina is a translation of the French phrase haute cuisine. There’s no separate professional tradition in Italy, apart from a few grand dishes prepared by the cooks of the rich. Even the rich ate essentially home food.” But Italian cuisine is not some sort of culinary museum. Far from it. There’s been a history of invasion, occupation, colonisation and the to and fro of immigration over millennia, and that’s had a huge impact on Italian food. Pasta, rice and flavoured ices came from the Arabs when they ruled Sicily. There have been Greeks, Romans, Franks, Goths, Spanish and many more who have left their culinary mark on the peninsula. The way the locals used and adapted from the various visitors is the interesting story. Adaptation and development of food culture in Italy has evolved differently to its neighbours. Fast-food chains are less prevalent. As of 2012, France had three times as many McDonalds outlets as Italy. Australia, with a third of the population of Italy, has twice as many. Traditionally Italians have had a large variety of regional fast food that is tasty, healthy and inexpensive. But it’s not that Italians don’t like hamburgers. They just want to make their own. In Catania, there’s a fast-food restaurant called Fud with an entire hamburger menu using all local Sicilian produce. There are the more conventional beef, veal and chicken burgers but also horse, donkey and vegan burgers. It seems that, once again, they’re adapting to an invasion. Italians shop differently to Australians, Americans and even their European neighbours. Farmers’ markets are a feature in all the cities and towns. And while there are supermarket chains, they are nowhere near as dominant as in Australia or the United States. The small foodstore and grocery sector accounts for 60 per cent of the floor space in Italy compared with 20 per cent in Spain, 19 per cent in Germany and France, and 13 per cent in the UK. An interesting and innovative development on the peninsula has been Eataly. After successfully opening its first store in Turin, it has expanded across the country and now includes multistoreyed stores in Rome and Milan as well as branches in Tokyo and New York. Eataly uses supermarket structure and organisation merged with the feel of an Italian market to sell high-quality products. It also combines the theatrics of the artisan – fresh mozzarella, ricotta and burrata are made in full view of customers – with the convenience of signature restaurants scattered throughout. Perhaps the most successful enterprise in spreading both the philosophical roots and the enormous depth of Italy’s food and wine culture has been Slow Food. What began as a grassroots movement in 1986, around a protest to McDonalds opening in Rome, has grown into a global organisation championing artisan farmers and their produce, biodiversity and sustainable food production. Italy today is caught in the tension between its regional food and globalisation, tradition and modernity. Perhaps the rest of the world’s attraction to Italian food and wine is, in part, the way Italians themselves are passionately navigating the modern world. Or maybe it’s just how good buffalo mozzarella and perfectly ripe tomatoes taste dressed with extra virgin olive oil. Travel to Napoli if you want a traditional pizza but elsewhere in Italy there is evolution and experimentation with everybody’s favourite fast food. Young pizzaioli are playing around with fermentation, hydration and special stone-milled flours as well as non-traditional toppings to raise the level of pizza in Italy. Here are five of my favourites of the new wave. Renato Bosco and his team prepare both classic and modern pizza using the highest quality ingredients. They’ll even serve a pizza degustation if you desire, all matched to wines and craft beers. Antonio Pappalardo began working in restaurants at just 10 years of age and became fascinated with pizza and the art of natural leavening. His traditional pizza is perfect and his modern twists and turns use seasonal produce of the highest order. For as long as he can remember, Edoardo Papa has always made pizza, and he loves to constantly experiment. 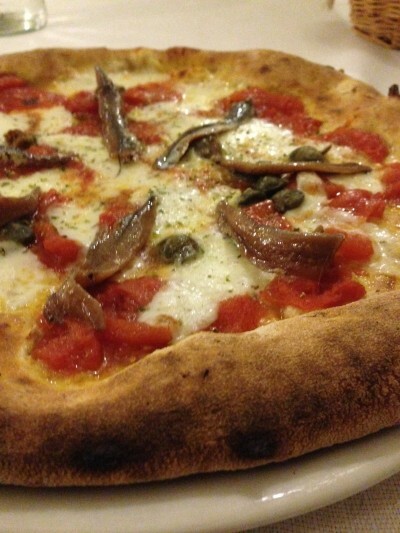 La Fucina was the first its kind in Rome and a visit is essential for anyone who loves pizza. uses only natural stone-ground flours to create two kinds of dough, one of wheat and one of spelt. Then he adds water, salt, and natural yeast or beer-yeast. Depending on the mixtures, the rising process takes a minimum of 24 hours to a maximum of 48 hours to complete. From there his toppings include some of Italy’s most esteemed produce. In the heart of Rome, close to the Vatican, Gabriele Bonci’s hole-in-the-wall has redefined Roman “pizza al taglio” using natural yeast and stone-milled organic flours. Very casual place with limited seating. Opens at 11am each day and does not take bookings.